Gabriel Burt's Blog: Banshee 1.0 Released! 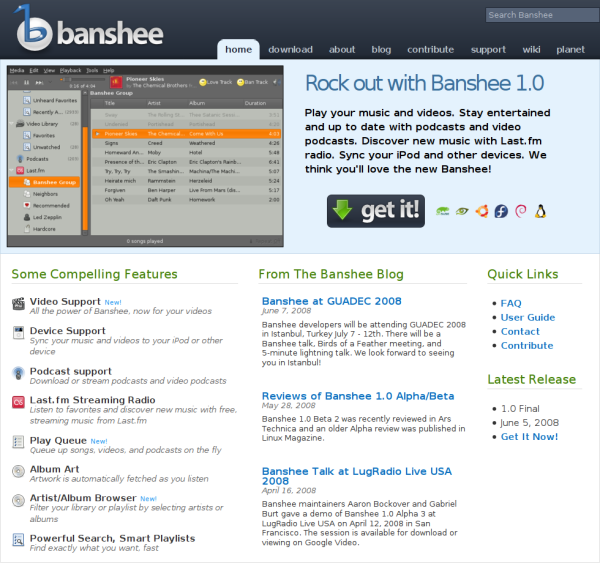 We have released Banshee 1.0, with all the great features we've blogged about in Alpha 1 through RC1. And we have an awesome new website! I'm loving using Banshee 1.0 every day, rediscovering my music library (and album art! ), discovering new music on Last.fm, and enjoying podcasts and video podcasts I never knew existed. Don't forget to come to our BoF, lightning talk, and main talk at GUADEC 2008! Digg It!